OOH – this blog post is WAY overdue, but things have been a little hectic at work and in training. Stay tuned for a wrap-up of this past weekend, coming to a PC near you in the next 48 hours. Last Sunday was undoubtedly one of the most awesome days of my very short and very limited tri life. To fully understand what I mean, you need to remember what happened to me last year. 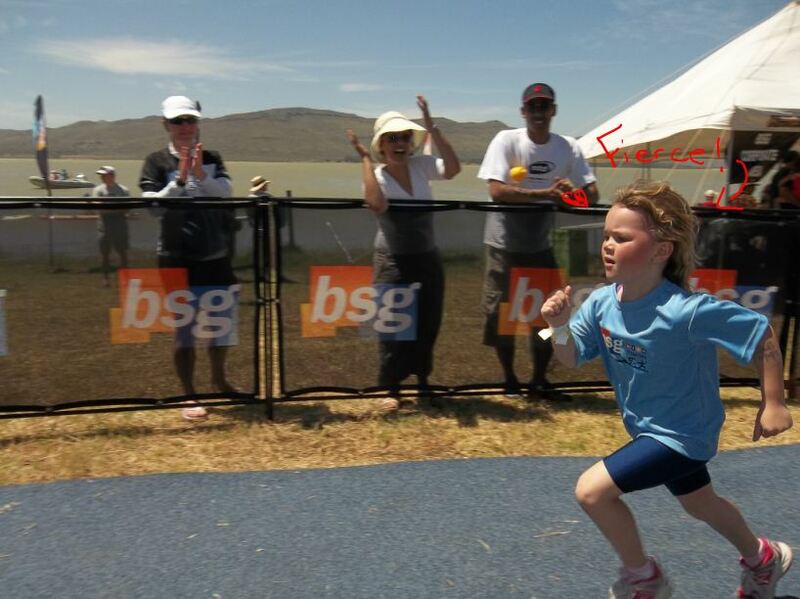 As a first-timer at the 2011 BSG tri in Worcester, I didn’t really know what to do or expect. I didn’t know anything about transition. I had never experienced an actual swim in open water before. More accurately, I couldn’t swim, but didn’t think that 600m would be a problem (I obviously know better today). Before I had even reached the first buoy, I got dunked by one of the team swimmers, resulting in me inhaling under water and spending the next 30 minutes crying and puking and doggie-paddling and backstroking to the other side. It wasn’t pretty. And the only reminder I have of that day is a blurry photo of my arm as I crossed the finish line. I was also a little peeved that I didn’t get a medal for my efforts because when you turn to run away from death’s door, you sure as hell deserve a memento of the day. Last Sunday was different. I did have my doubts on the way there though, because after packing bikes, kit and sleeping kids in the bakkie, I realised that Da Husband was still enjoying his beauty sleep and we were very, very late. 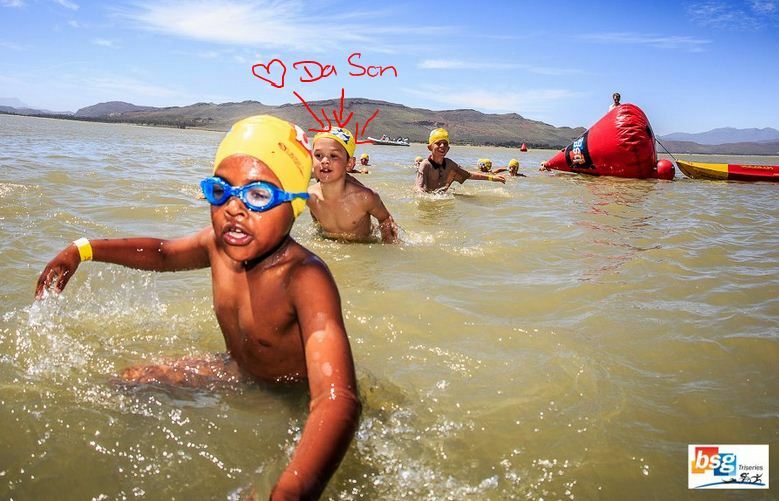 After finally meeting up with Sofie and Radesh at the One Stop, our tri convoy traveled through Rawsonville to Brandvlei Prison, where the race was held. I was a little nervous as we approached the dam, because last year’s weather was so crap that the dam had actual waves! But things were different this time around: not a breath of wind, crystal clear water and the promise of a warm day. So we registered, I showed Da Husband and Da Kids where our team gazebo was stationed (always important to show kids where to go when they get lost) and got ready. The actual swim start was a bit of a blur, but I was relaxed and excited and nobody could hold me back when it was our turn to start. I quickly lost sight of Sofie and Tanja because things get a little hectic in the washing machine of arms, legs, feet and elbows. But there I was, calmly swimming towards the first buoy and navigating a crowded right-turn. Before I knew it, I had passed the first people that started a few minutes ahead of us, and I was dishing out advice to struggling swimmers! One particular lady seemed to have a tough time, on her back and tugging at her wetsuit. She reminded me of me. I told her to relax, not let in too much water and just try to get her heart rate down while thinking calming thoughts. “But you don’t understand,” she wailed. “I can’t do this!! !” “No, believe me, I truly understand what you’re going through,” I replied. “But anyways, good luck and have fun! !” And I continued swimming towards the finish. 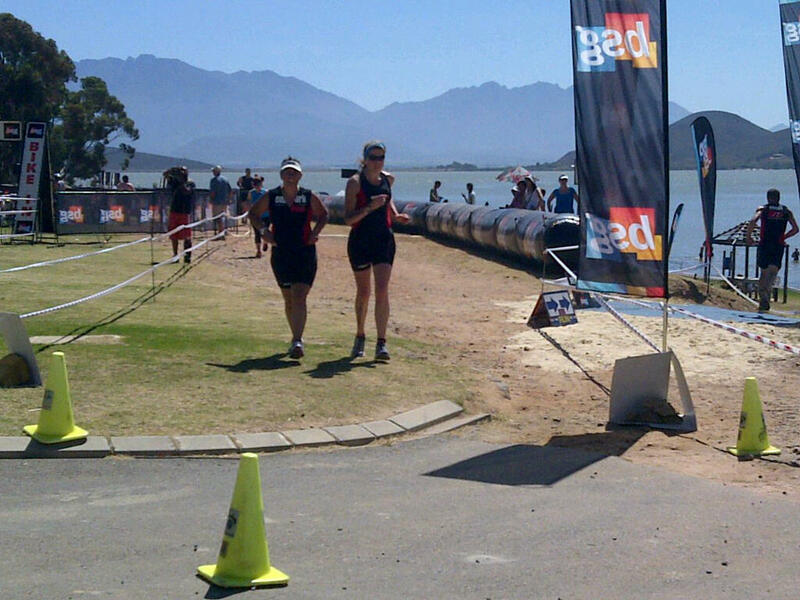 The last bit of the swim consisted of me laughing so much that I kept on swallowing water. Nothing could wipe my megawatt smile off of my face! But the best part: Having Stacey and Adri shouting their heads off, having Da Son running next to me to the exit point, shouting “you can do it mommeeeeeeeeeeeeeeeeeeeey” and seeing Da Husband and Da Chick waiting for me at the top. The cycle was a breeze. The run was great (just a little slower than last year because I drank too much water and the slushing water in my tummy was very distracting). But all that mattered was that I owned Brandvlei dam. Then it was Da Kids’ turn to tri. Da Chick had a bit of a meltdown before the swim so I promptly grabbed her and ran through the water with her. She came to her senses about 15m before the exit point and swam the last bit. I missed the cycle but we waited for them at the finish and felt SO proud when they came running down towards the finish line. My babies are tri-kids! Wonderful and inspiring. Loving your journey.